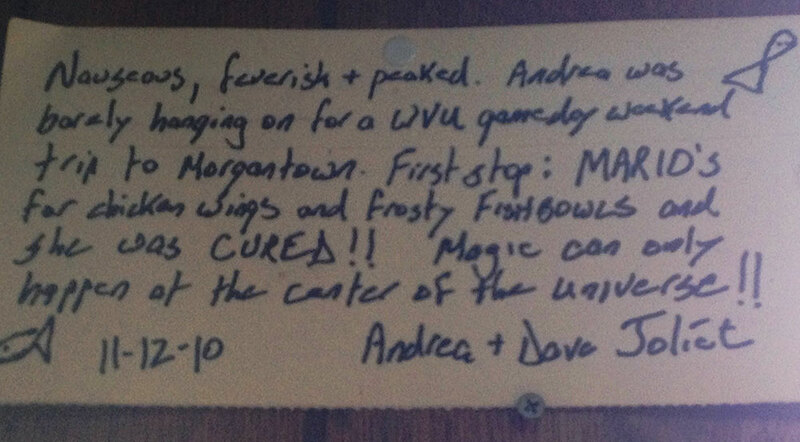 You can’t make a trip to Morgantown without visiting the center of the universe – Mario’s Fishbowl on Richwood Ave. Locals, alumni and students alike are drawn to it like a conga line of ants to a sugar spill. It’s a place where even out-of-towners feel like locals. 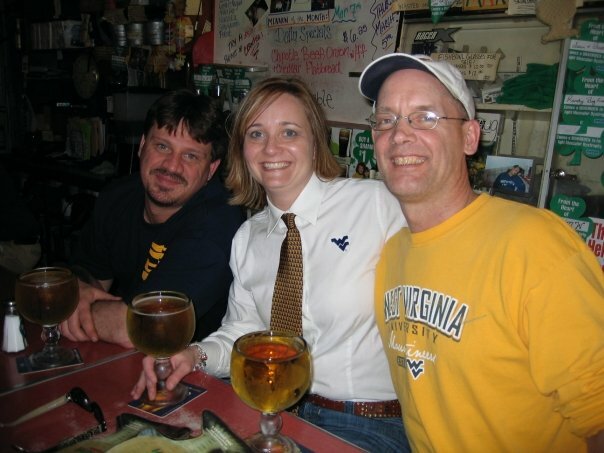 If you happen to walk in when “Take Me Home, Country Roads” is playing on the jukebox, be prepared to sing along with the rest of the crowd. Other favorites that will get the whole bar singing include “Piano Man” (Billy Joel), “Family Tradition” (Hank Williams, Jr.), “You Never Even Called Me By My Name” (David Allen Coe), and “I Love This Bar” (Toby Keith). In fact, if you play the jukebox there, I recommend you stick to songs released in the last century. Adding to the unique ambience of this iconic dive is the history spilling from the walls like a Bud Light tap into a frosty Fishbowl goblet. 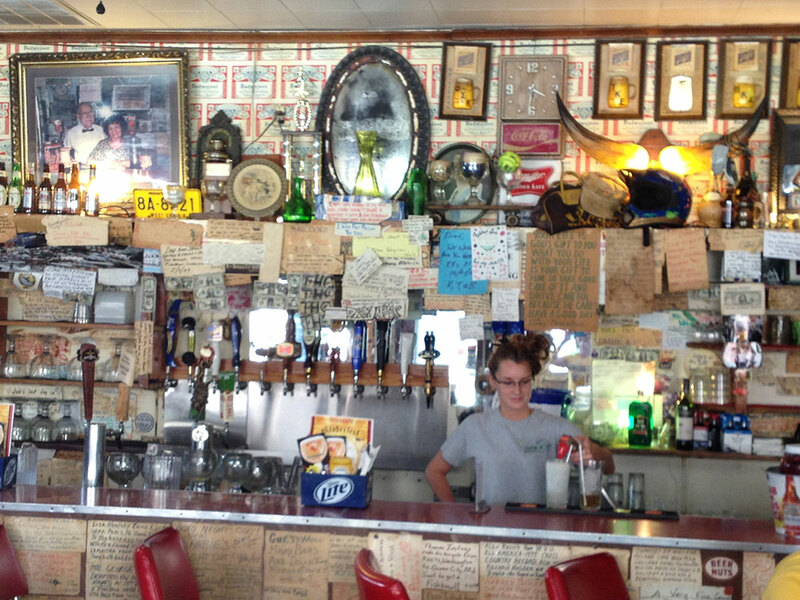 A mosaic of recycled pieces of cardboard, paper plates, coasters, receipts, and any other note paper a patron can get his hands on, coats every square inch of the walls. The worn and yellowed edges of the mosaic pieces create a distinctive and nuanced memoir spanning generations. Recently, the Fishbowl also expanded its taps to include some craft beers. I highly recommend anything from Chestnut Brew Works, which is from a local guy named Bill Rittenour who uses his doctorate in plant pathology to make some of the best microbrew around. Brews Travelers 365, of Dallas, Texas, even named it among the 10 most memorable breweries on their 120-day East Coast tour where they visited a brewery every day. Mario’s also has the best wings in any town. They’re always cooked just right – with crispy skins and plenty of chicken meat. They’re not puny – or undercooked – like a lot of wings I come across. Dave and I can’t go there without ordering hot wings with celery and their delicious, chunky blue cheese. Their hand-cut fries are also irresistibly tasty. Once you start eating them, you cannot stop until there aren’t any left. 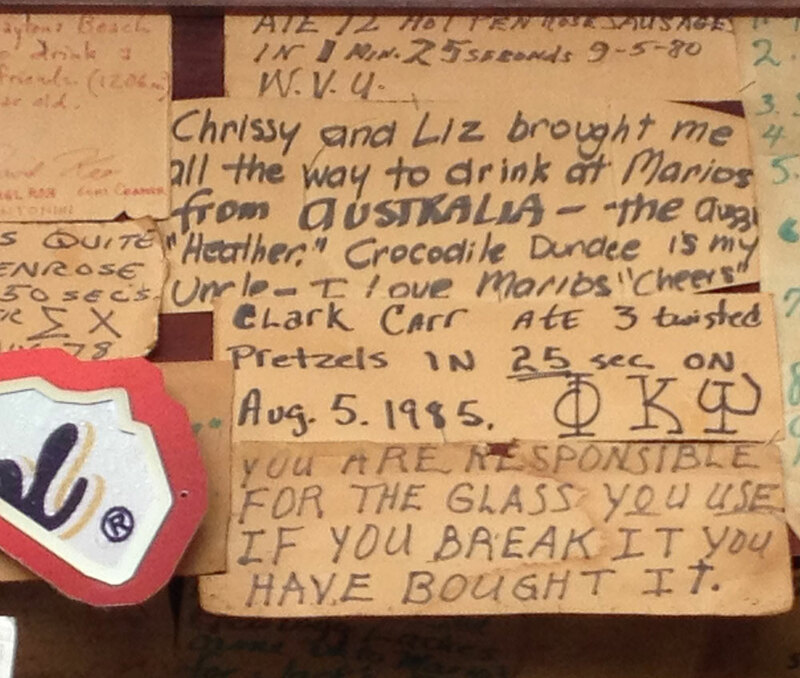 Dave also loves their Philly Cheesesteak, but I’m not a big Philly Cheesesteak fan. I’ll just eat the side of fries, thank you very much. 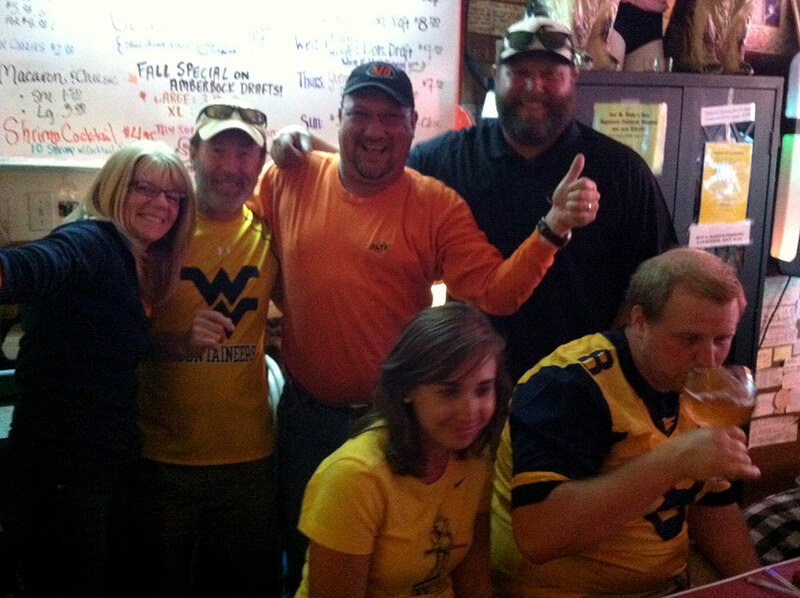 I love all things #tailgating and #WVU. My other passions include reading, music, golf, health & fitness, and traveling. My husband will tell you I'm also a bona fide TV junkie. 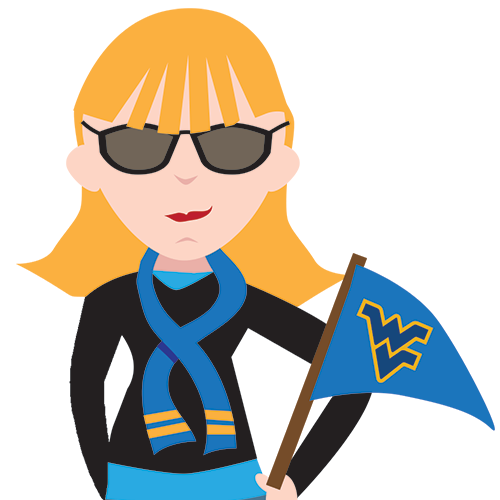 I'm currently a @wvuimc grad student and an integrated marketing communications professional in Akron, Ohio. You’re a blogging wizard. And there’s no gender attached to this kind of wizardry. Can’t wait for the next installment. We also love the Fishbowl and look forward to hanging out there almost as much as we do watching the football games! I agree about the wings! Didn’t know about the craft beer, though! Looking forward to sampling sips of that next weekend as I belt out the lyrics to Piano Man. “It’s a place where even out-of-towners feel like locals” is 100% accurate! I’ve never experienced any place like it. Can’t wait to try the craft beers in October!